Spring keeps coming and swiftly going here in London so once more we're stuck in sartorial limbo when it comes to throwing on some clothes in the morning. My Spring/Summer wardrobe is coming along nicely but I must admit it's pretty frustrating when I find myself reaching for one of the few chunky knits I left rather than my new Spring pieces. Over the last week I've pretty much been living in my faithful jeans/tee/blazer combo which I'm deeming as my Spring uniform and hoodwinking everyone into thinking that I'm made of steel, when really there's a couple of thermals layered under these tees. 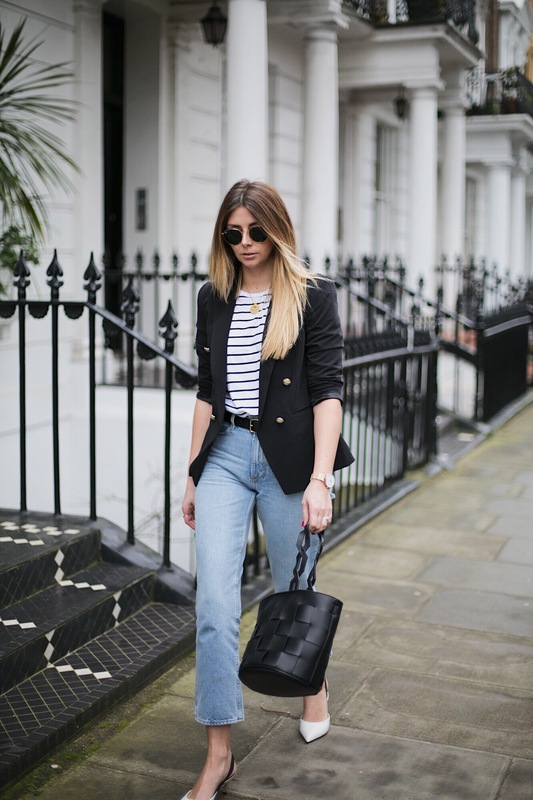 Today's jeans/tee/blazer combo is definitely one I always whip out every spring. Stripes are an essential part of my Spring wardrobe and I have quite the collection of striped t-shirts which simply rotate as we roll into Summer. This black and white stripe t-shirt has been one of my favourites this season (last worn here) and you'll be pleased to hear is high street so super purse friendly. This black military blazer is also high street (but shhhhh don't tell anyone) but it fits a little on the small side, and you know me guys, I always size up by 1 or 2 sizes in blazers anyway (I'm wearing a 12 in this one). I feel like I don't even need to mention these jeans because you're probably all bored of seeing them but this should demonstrate that it really is worth spending a little more on denim because they will last season after season and you just can't get this kind of fit with high street jeans, sorry, but true (Stay tuned for my denim post coming soon).